More Than Just Great Dancing® SFT Teacher Edition. The latest iteration of Sales Force Training™ is here! Join expert sales trainer, Alana Hess, for an unprecedented view of practical application sales training for teachers in the classroom. 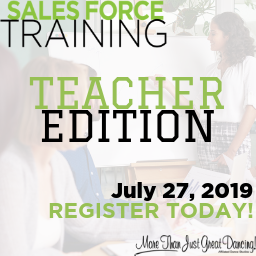 This training is specifically designed with educators and program directors in mind and will transform your teaching staff into sales and retention masters! If you need to get your teaching staff working in a service selling mindset and support your business growth goals through sales, then this training is for YOU!